This post was also posted on marknicklas.wordpress.com. Several weeks ago I was with our dental team in Southeast Alaska. After a week of serving Prince of Wales Island this was a day of recreation. The locals offered an array of opportunities for the team – sea kayaking, hiking, hunting, fishing and more. I took a skiff and went out with a few members of the team so they could fish. It was pure Alaska – cold rain poured down on us relentlessly. We only caught a few salmon and rockfish (I blame the guide) before heading in at noon to pick up those who wanted to fish in the afternoon. Given the weather there were only two takers. The weather began to clear as soon as we set out. We had just dropped our lines when water began to boil about a hundred yards off the port bow. All of a sudden six humpback whales burst out of the water. They rose above the water and were high enough to see the side fins before they crashed back onto the water. They were “bubble feeding.” We had seen whales all morning, but this was something new. 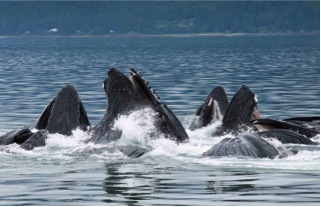 When whales bubble feed they work as a team to corral herring. They dive very deep under a school of herring and then blow bubbles as they swim up in a diminishing circle. Herring cannot swim through bubbles. The shrinking ring encircles them. When it gets small enough the whales swim upward with mouths agape swallowing thousands of fish. This was repeated again and again, sometimes only a few dozen feet from our skiff. The teamwork of these huge creatures was amazing! As we were finishing our afternoon of fishing a group of about 15 to 20 Dall porpoises took an interest in us (or maybe it was the herring dispersed by the whales) and began to swim all around us. Dall Porpoises look like miniature Orca whales. They were lightning fast, jumping in all directions. It reminded me of the quick flashes of swimming creatures in the mermaid scene in thenPirates of the Caribbean. It made for a great end of the week for the two dental team members who braved the weather to go out on the water. The dental team was the fourth of our teams to participate in ministry to Southeast Alaska. Two Beaverton Foursquare harvesting teams and a construction team served there already. One more construction team is slated for mid-September. The community of Coffman Cove seemed to come alive with the presence of the Holy Spirit. Our team, led by Drs. Duy Anh and Melodee Tran, served beautifully. The people of Coffman Cove were overwhelmed with the idea that a group of medical professionals would come to their community, at their own expense no less, in order to serve people they did not even know. The first day of clinic operation was Sunday. By Monday afternoon the locals were bringing gifts – smoked salmon, grilled salmon, fireweed honey, crabs, oysters and even smoked pizza. The clinic became a “water cooler” for the community. For those of us who are used to semiannual visits to dentists, this may seem a bit surprising. But if you have dealt with chronic dental issues and no way to get the help you need, it is a huge blessing. The team kept telling the locals that it was arranged by the Foursquare missionaries to Southeast Alaska, Joel and Trish. God is granting them amazing favor with the people there, and we get to be a part of it. One woman said to Melodee, “I hated the way I looked. I can smile again and I now like the way I look.” Another man said, “I have been in pain for so long! I cannot believe that you came here to do this for me.” I have been to this area numerous times and have never seen this type of community warmth. Everywhere I went in the village people were talking about it. “For the past several years there is a group of people who have come to our island as friends. They came to work alongside us in our way – building friendships and respecting and loving our people and our culture. They came to put a new face on what it means to be missionaries and to demonstrate the love of God. I want to recognize our friends, the Foursquare Church. Will you please stand?” And there was applause. In just a few years we have gone from curious intruders to friends. Joel and Trish have done a superb job of coordinating the efforts of churches like ours in an effort to build the Foursquare presence. )I thought about the amount of teamwork it takes to do bubble feeding. Whales do it thousands of times a year, so they get plenty of practice (the herring, on the other hand, not so much). When you do something again and again as a team you learn how to do it well. I am so grateful for the heart of our church in sending missionaries – long-term as well as short-term. We have learned how to go with servants’ hearts. Our circling ring is not to feed on anyone, but rather to bring the freshness of the Spirit – to create an outpost of the Kingdom where God’s presence is palpable. We only go where we are invited. The locals lead. We do everything possible to be a blessing and never a burden. That is exactly how Joel and Trish describe the Beaverton teams. And by the grace of God it is how the mayor of Hydaburg introduced our team to the larger native community.